Dental veneers (sometimes called porcelain veneers or dental porcelain laminates) are thin shells of tooth-colored materials, made to cover the front surface of teeth to improve their appearance. Dental veneers can be made from porcelain or from resin composite materials. Porcelain veneers resist stains better than resin veneers and appear more like natural teeth. You will need to discuss the best choice of veneer material for you with your dentist. Diagnosis and treatment planning: During this appointment, your dentist will examine your teeth to make sure dental veneers are appropriate for you and discuss what the procedure will involve and some of its limitations. He or she also may take X-rays and possibly make impressions of your mouth and teeth. To prepare a tooth for a veneer, your dentist will remove about 1/2 millimeter of enamel from the tooth surface, which is an amount nearly equal to the thickness of the veneer to be added to the tooth surface. It usually takes 1-2 weeks for your dentist to receive the veneers back from the laboratory. Temporary dental veneers would be placed on the prepared surfaces for these 1-2 weeks while you are waiting for the permanent veneers. A special cement is applied to the veneer and the permanent veneer is then placed on your tooth. Your dentist may ask you to return for a follow-up visit in a couple of weeks to check how your gums are responding to the presence of your veneer and to once again examine the veneer’s placement. Veneers offer a conservative approach to changing a tooth’s color and shape; veneers generally don’t require the extensive shaping prior to the procedure that crowns. Veneers may not exactly match the color of your other teeth. Also, the veneer’s color cannot be altered once in place. If you plan on whitening your teeth, you need to get them whitened (bleaching) before getting veneers. 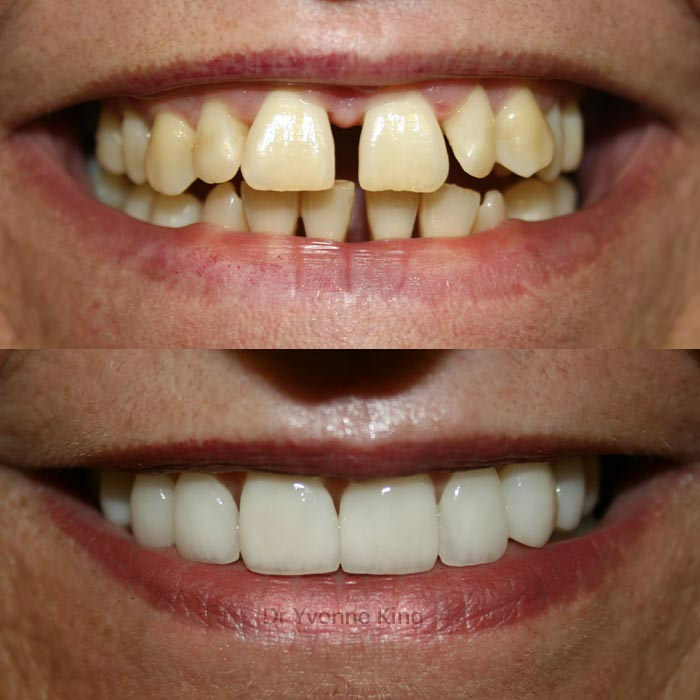 Dental veneers do not require any special care. Continue to follow good oral hygiene practices, including brushing and flossing as you normally would. And dentist visit every 6 months. You’ll find information on Dental Veneers in this article on our blog.